First there was a wilderness, although the people living here wouldn’t have called it that. They called the big river Multnomah, and they would have lived, hunted, and gathered here for many centuries. There would have been many trees here, and what we now call the oak tree would have been particularly valuable to the people. There would have been groves of them all over this hillside looking over the river. It’s hard to even see the river anymore. 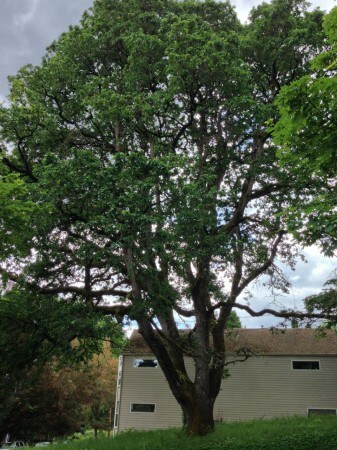 And sometime before the first white men arrived, another little oak got started here. 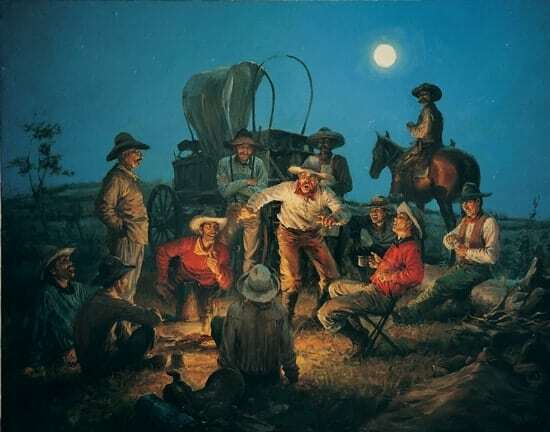 Then the white men came, and left. And then more came, and one of them, William Johnson built the first cabin just down the hill from here. There is still a plaque marking the spot, or somewhere near it. Then there were many more cabins, and a town, and the trees started coming down. 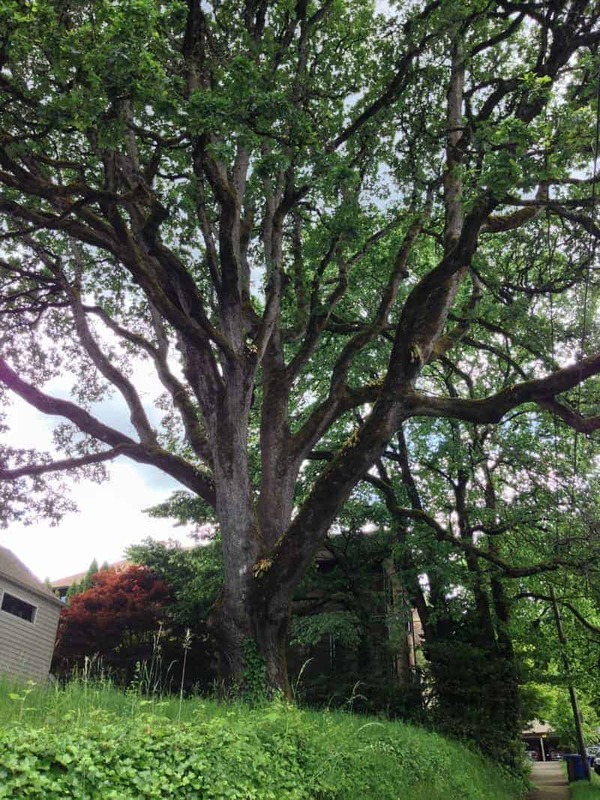 The town grew, and a man named Terwilliger got a land claim of a square mile that included our little oak tree with the view of the river. The land was broken up into lots, and a neighborhood was created. There were even a couple of parks, one of them Terwilliger Park, with a playground and bandstand. The city almost got this one, too. And then, in 1988, this little lot at the corner of Corbett and Lane was purchased by a developer who specialized in row houses. There was an 1885 Queen Anne on the property, and the developer announced plans to demolish that and cut down the tree, now something like 300 years old and a grand specimen indeed: six stories high with a trunk 13 feet around. Enough with the cutting of trees, enough with row houses, enough with no parks, enough cutting us off from nature. 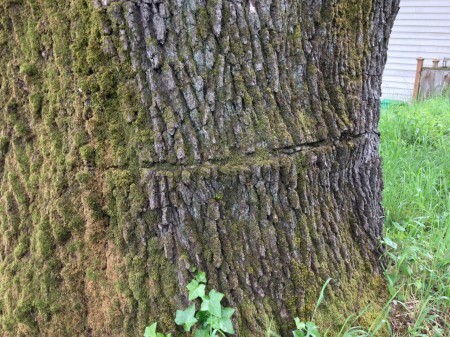 A worker showed up to girdle the tree, the first part of cutting it, and somebody went out and stopped him. 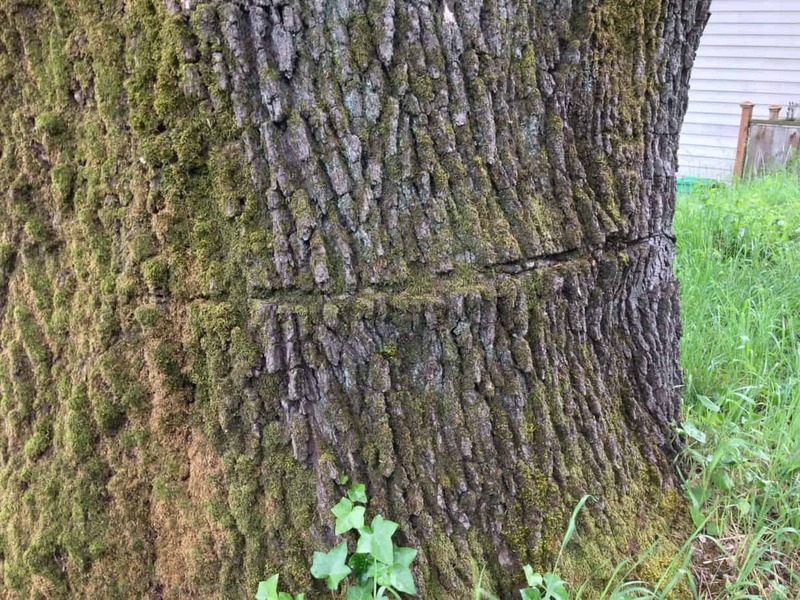 He came back, girdled two-thirds of the trunk, and somebody showed up again – this time with a shovel. The worker left, and the line had been drawn. Day-and-night vigils were kept at the tree. Eventually it was wrapped in chain and metal fencing to keep the saws at bay. 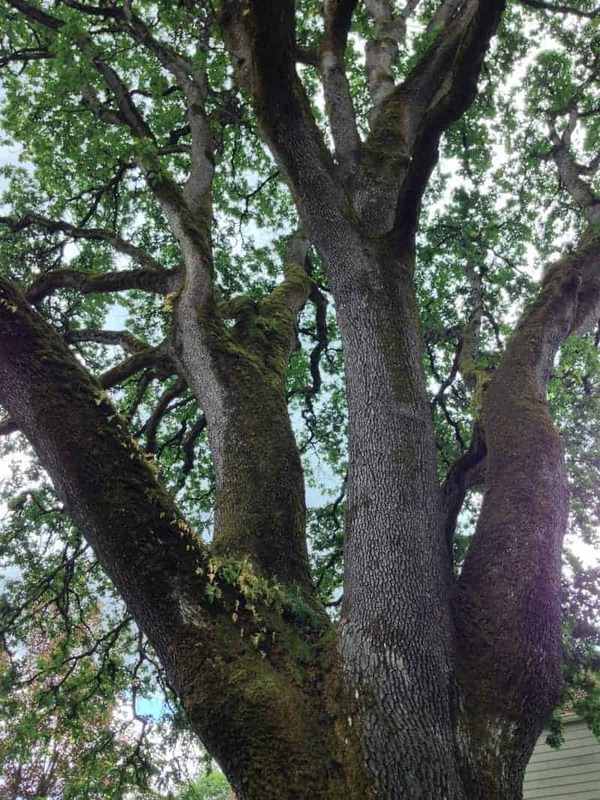 A group formed, calling itself Friends of the Oak. The development was halted in its tracks, at least on this corner. The media noticed, the City Council voted its symbolic support, and the neighborhood came together. 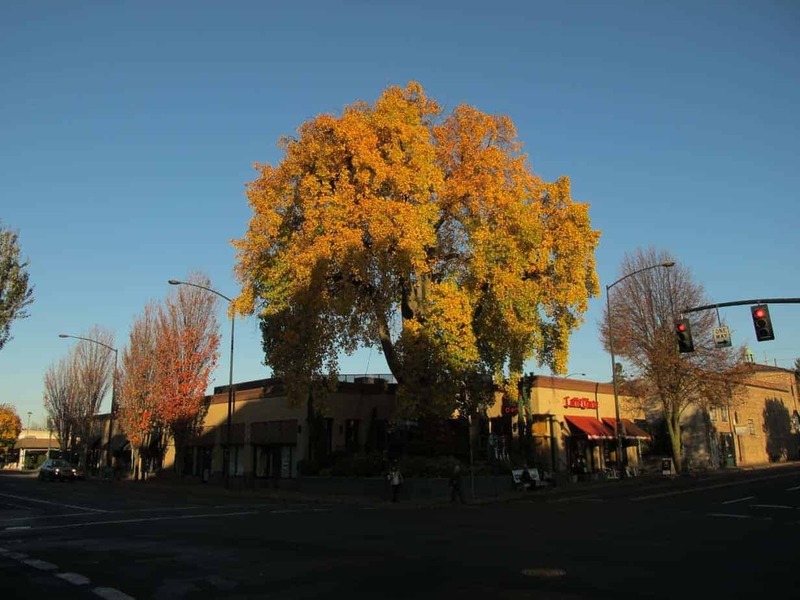 They didn’t just want to save the tree; they also wanted a park. What’s a neighborhood without a park? Somewhere along the way, the development company went belly-up, and the little 40×100 lot was left to a lawyer. He wanted $57,000 for it, the city pitched in $16,000 (its assessed value) and the fundraising effort was on. Donations ranged from $1,000 checks and foundation grants to $1.50 from a child’s allowance. The mayor of Portland, Vera Katz, cut a check for $100 during a City Council meeting. 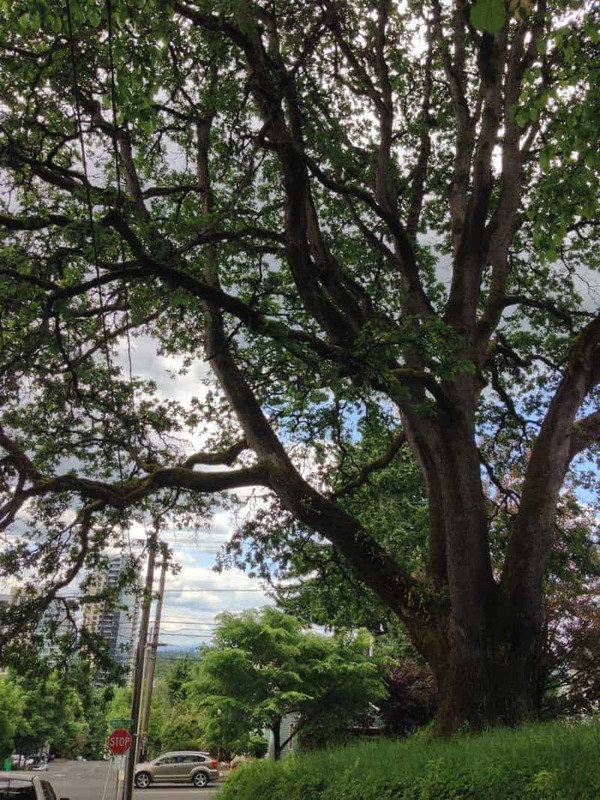 It took 10 years, and fighting off another developer, but the land was bought, and it became Heritage Tree Park. Something else changed, though. 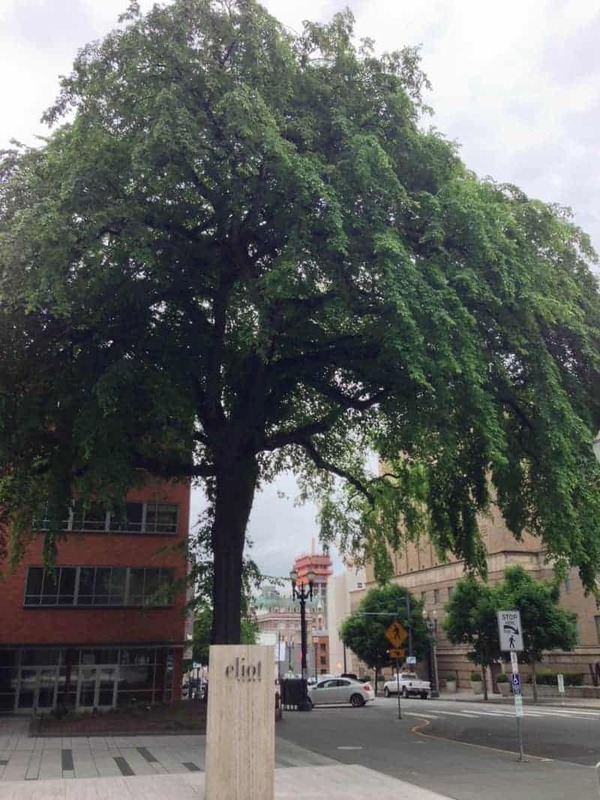 The city had taken greater notice of its trees, and in 1993 the Portland Heritage Tree program was begun. 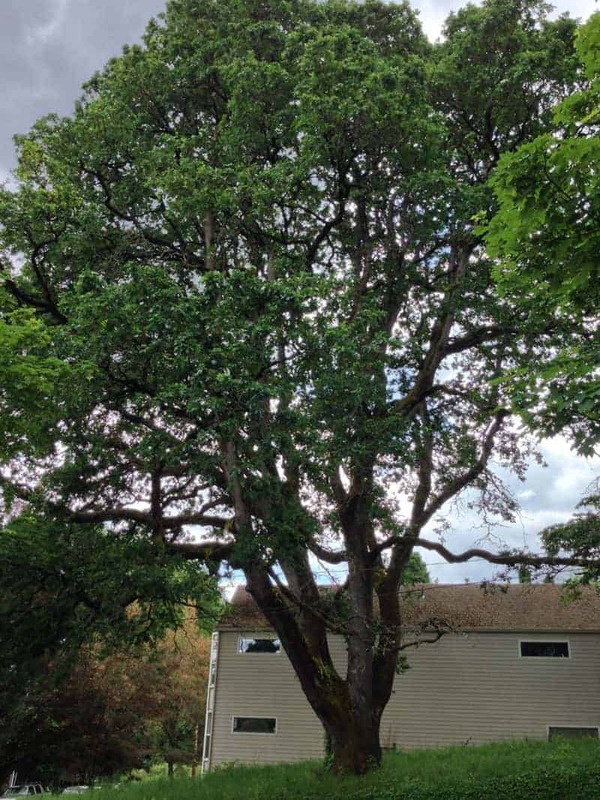 Five years later, when all the money was raised, the land bought, and the park established, the Corbett Oak officially became a Portland Heritage Tree. It’s old, but it’s grand and mighty healthy. It was attacked, but has healed. It has never been pruned. It’s one of the last of its generation, up here on the hill where you can still just make out the river down below, between the highway and the buildings. As for the park, it’s mostly been left alone: no path, no sign, nothing. Neither it, nor the tree that nearly fills it, needs us for much of anything. In fact, Google Maps doesn’t even send you to the right place! 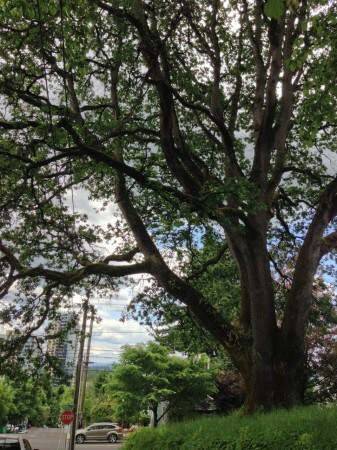 There’s a whole lot of city where there used to be a wilderness, but thanks to a lot of folks who said “enough,” we can still sit at the foot of this tree and, just maybe, feel some of that old natural peace. There are more descriptions of Portland Heritage Trees here. I am also writing a book about them, with photographs by Steve Terrill. I took the photos in this post. 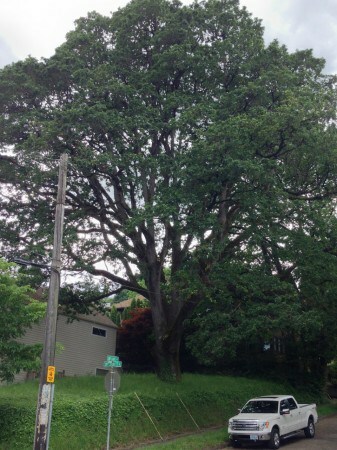 Portland Heritage Tree #3 – Tulip Tree, NE Weidler Ave.